Founded in 1928, Bryanston is a leading co-educational independent school and occupies a large country house near the town of Blandford Forum. The school has extensive sports facilities and has recently re-developed its sports centre, where the new heating has been installed. A key requirement of the heating system was the ability to respond efficiently to varying occupancy levels in different areas of the sports centre. 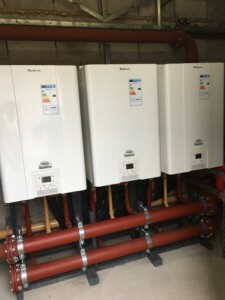 To address this the radiant panels are configured in zones, whilst the cascade configuration of the boilers, combined with modulating burners, ensures efficient performance at all loads. 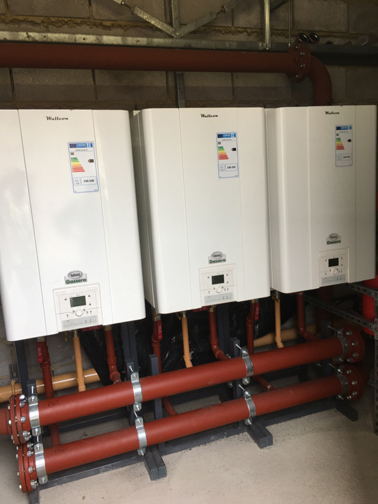 For ease and speed of installation, the MHG Gassero Wallcon gas-fired condensing boilers and associated components were pre-assembled by MHG onto a matched mounting frame system which was then simply slid into position in the plant room.